Drama/Musical/Musical/Romance, Španělsko, 1983, 102 min. Tagline They're dancing a fine line between fantasy and reality. Synopsis A group of flamenco dancers are rehearsing a very spanish version of the Prosper Merimee's drama. 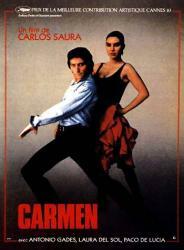 Antonio (the coreographer) falls in love with Carmen (the main dancer). Their story then turns similar to the play.